Hamsters are curious and busy creatures, and while they may seem content to exist in a small world, they enjoy the occasional outing. The world holds many dangers for these tiny balls of fur, so allowing them to explore what lies beyond their cage is much safer in a suitable playpen enclosure. 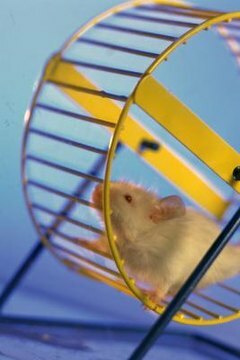 Hamsters enjoy playtime, but occasionally they may grow bored from running in a wheel that essentially takes them nowhere. A hamster playpen can afford your furry friend the opportunity to stretch her legs while keeping her safe from harm. Corrugated plastic is a great material for building a hamster playpen. It's durable, and your hamster will have no luck trying to scale its slippery walls. The plastic can be easily fastened together with inexpensive binder clips purchased at an office supply store, and a few sheets can create a sizeable playground. Plastic is easily cleaned, and the binder clips allow for easy assembly and disassembly. Placing the plastic playpen on a linoleum or tile surface, as opposed to carpet, makes for a far easier cleanup when playtime has ended. While you won't find hamsters lining up to watch the latest prime-time drama shown in HD, the large box your television, other electronics or small appliances arrive in can also serve as a quick and easy hamster playpen. Cardboard isn't as durable as plastic, so while you won't need to buy a television every few weeks, you may find yourself swapping out your hamster's playpen box pretty frequently. Hamsters aren't picky about where they do their business, and urine and feces can build up quickly. Laying plastic or a contractor bag under your makeshift playpen can protect the floor underneath. If you don't have a large box lying around, cardboard pieces can also be made into a hamster playpen. Using the same method as with plastic, fashioning the cardboard together using binder clips creates simple assembly and also allows for any damaged pieces to be swapped out easily. Two playpens can be joined using cardboard panels, and the playpen can be fashioned into a maze for added fun. If you're not concerned with disassembling, packing tape or duct tape can serve as a means of permanently attaching the panels, and if the panels are the same size, the playpen should fold easily for storage. Regardless of whether or not you choose plastic or cardboard for your hamster playpen, simply placing your hamster inside the enclosure to change her scenery might not be the stimulation your little friend is seeking. Creating food and play stations can make the simplest box a grand time for a hamster. A wheel in a new location might take on a completely different feel, and adding multi-level boxes, or even a small wire cage inside the playpen, will create a veritable playground for your little rodent pal. A couple of coffee cans with bottoms and all sharp edges removed can provide tunnels and hiding places for your hamster to explore. Regardless of the faith you may have in the security of your hamster's playpen, she should never be left unattended. Hamsters are sneaky, and turning your back for even a moment might be just long enough for your little girl to get into big trouble. Should Hamsters Live in a Tank or Cage?